Summer is moving along, still hot, though! It was only 89 today in Kansas City, so that’s better than it has been. 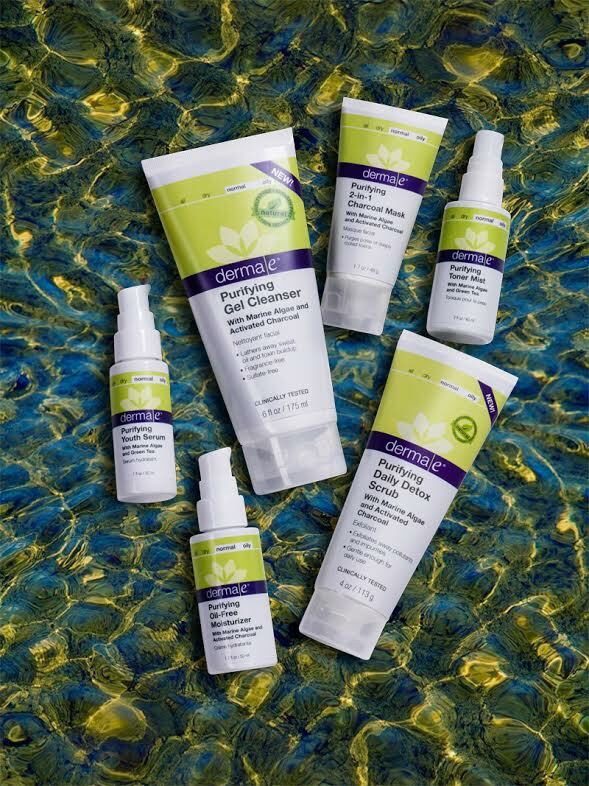 derma e Purifying Collection — It happens day in and day out. Oil, sweat, bacteria and micropollutants build up on skin and clog pores, leading to visible damage such as acne, blemishes, sensitivity, fine lines, wrinkles, thinning or sagging skin. That’s why derma e® brings you Purifying Skincare. Doctor developed and clinically tested, it’s like a deep detox program to cleanse and reboot skin every day so it glows with pure health for years to come. Specially designed for oily, active or urban skin types, Purifying formulas work naturally to draw out toxins, replenish vital nutrients and restore skin’s resistance to oxidative stress. Plus, the line is allergy tested and made with minimal ingredients, so it’s also safe for reactive skin. What I think: I have sensitive skin and have been testing the Purifying Toner Mist ($15.50 USD) and the Purifying 2-in-1 Charcoal Mask ($19.50 USD). The mist is refreshing on the skin, but it doesn’t irritate my sensitive skin. The mask gently exfoliates and leaves my skin glowing! Lumene Blur Pore and Line Minimizer ($19.99 USD) — Optical line and pore minimizer with instantly beautifying effect. The Lumene Bright Now Blur Line & Pore Minimizer makes skin instantly more beautiful and even-looking. Helps to control shine and provides a natural-looking, all day matte finish. The beautifying effect is based on the fact that the product optically diminishes the appearance of fine lines and pores. Makes skin look and feel instantly more soft and supple. The innovative texture of the product helps the skin look flawless even longer and keeps skin matte and shine free all day long while delivering a brighter and more radiant look. Enriched with the potent extract of the resilient Arctic cloudberry to protect and detoxify, the product effectively diminishes signs of uneven texture of skin. Suitable for all skin types. Oil-Free. Formulated without parabens, formaldehyde donors, mineral oil. 30 ml, 1.0 FL.OZ. What I think: What to do about blotchy summer skin? Use this blur pore and line minimizer! It instantly smoothes skin and minimizes lines, pores and other imperfections. Plus it feels light on, which is important during the summer. Vaseline Intensive Care Aloe Soothe Spray Moisturizer ($6.49 USD) — With summer in full swing, you want to ensure that your bare skin is hydrated all season long. Thanks to Vaseline® Intensive Care Aloe Soothe Spray Moisturizer, you can get the moisture you need, especially after a day in the sun. This product is a quick, convenient spray lotion that moisturizes and absorbs in seconds, to heal dry skin. Now infused with micro-droplets of Vaseline® Jelly and pure aloe, skin feels instantly hydrated, never sticky or greasy – it’s the perfect item to throw in your beach bag to keep skin feeling fresh throughout those long, hot days. What I think: I have to say that I do love spray moisturizers. They are quick and easy to use. This moisturizer has a clean scent and feels cool when sprayed on. I spray it down my arms and legs then rub it in. Fast and it leaves my skin so soft! Perfect for burned skin or even just skin that is dry from chlorine and self-tanner. Vaseline® Intensive Care Aloe Soothe Spray Moisturizer is available in food, drug and mass retailers for $6.49 (SRP). Q’urNail — ($10.50 USD) — Reduces destructive effects caused by fungus. Nourishes nails, improves skin’s appearance around the affected area. Useful for nails, cuticles and skin where fungus and other irritation can occur. What I think: I haven’t had to use this yet, but I like how if myself or anyone in my family has nail fungus problems, this will help the appearance and feel of the skin around the nails. Very important for sandal season. What new products are you loving this week? Leave a comment and let me know!